I am totally new at sewing, how do I complete a word that want fit into my hoop and keep the monogram straight when I re hoop it? I am new to embroidering and I have the SE400. I am trying to embroider words to attach to quilts I have made and cannot figure out an easy way to do this. Any help would be greatly appreciated. I want to put a letter inside the round circle frame. I made the frame as large as it would go and embroidered it. Without re-hooping, I chose the letter, made it as large as it could go (again wtih the layout adjust feature) and pressed start. The letter did fit inside the round frame, but wasn’t centered. Why not? What do i need to do instead? I had the same issue. They may have been italicized which effected it centring properly. 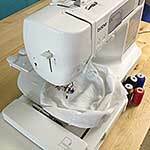 I have since then started using SewWhatPro. Much easier, although I haven’t figured out how to put a satin boarder around my letter. The SE400 has several boarders that I like so I’ve stitched my monogram using the software then stitched the preprogrammed boarder. I did a test stitch first and it centered perfectly. I just got my machine in January and have so much to learn. But I’m loving it! I purchased a large hoop to do larger projects. Important note: the SE400 can only stitch 4×4 and smaller. But with the larger hoop, you don’t have to rehoop as often. Example I did a Minnie sillhoutte with a bow and my granddaugther’s name below. I had to do three separate files, one for the head, one for the bow, & one for the name. But I didn’t have to rehoop so it lined up perfectly. just got my se400 and happened across your website. Just had to send a quick note to let you know I just love the tips they are helping a lot. I am very new to embroidering. Is there a need to always match the bobbin thread with the top thread? I hardly ever match my top thread to my bobbin thread when doing embroidery or applique. Embroidery thread can be expensive, so i bought a box of pre-wound white bobbins. It may sound funny…..but it is thread only….and you put it in the bobbin hole. It will work fine most of the time, but it will stop working about 2/3 out, so there is some wastage but they’re cheap. I hate winding bobbins, and these you just pop in. (I also use these pre-wound bobbins on a lot of sewing such as quilting where the thread can be white). You can buy pre-wound in other colors such as black I think. Also….I bought all my stuff in bulk when I purchased my machine….large quantities of the bobbins, needles of various sizes, and a set of 150 different embroidery colors, three different kinds of stabilizer sheets….and doing this has been awesome! I have only had to go purchase embroidery thread at a store once, and none of the other supplies…and I have made many projects for friends and family. I got it all on ebay, and just watched the auctions or buy it now, and looked for larger quantities. I am cheap, and I hate having to go shopping every time I’m in the mood to create, so I went this way. I’m just starting to learn the basics of sewing and really want to become skilled in monogramming. I have a se400 and I’m confused about a couple things. If I can buy the monogram fonts/files, what is the need for buying the high-priced software? Can I not just purchase the files I want to use, upload them to my machine, and that be that? Please give me some insight on why I may need additional software and if my thoughts are correct. I love your site and appreciate all the good info you have on here! You have to have a program to “read” the file you download. I personally like embroidery magic 2, but have head there are other good ones. I bought that program from ebay cheap). I have heard embird is good, and used to be free or cheap, but I couldn’t find a good price. I also found a program called “sophie sew” which is very basic and free for now (in the works for upgrade and then will have a price). There are good, cheap programs out there, but yes you need a program. i own the Brother 770. I’m elderly and am proud that I learned to use the machine and have done hundreds of projects in the last year. You tube has been a wonderful help. I was wondering if there is a way to backtrack on a design. If the top or bobbin thread cause a problem the machine skips stitches before it notes the problem. I’ve been able to correct the design by sewing a scrap piece up to the point of error than putting the original project back on the machine. There must be an easier way. Do you have any suggestions on what books would have good machine use instructions. I feel it is difficult to keep referring to the online help. I am thinking by now you probably have the answer to your question but if not, yes there is a much easier way. I own a brother se400 but I believe your machine probably has the same features that I have on mine. If you still need some assistance, feel free to email me. Someday I hope to own the 770 for the larger hoop size. It is a learning curve for all of us! I have the SE400 also and would like to do at least 3.9 size monogram. Can I do this by simply downloading one of these programs? I have figured out how to transfer my design from my pc to the se400 but when I go to save it, it comes up and says peacock blue. I want to save the initals without any specific color. When I have the letters showing and I click on the save icon I get a beep , I can highlight the letter and I still get a beep, but when I push the retrieve button at the top , it says peacock blue, I do not want that color, I just want to save the letters. I am going to use a hot pink. How can I save the letters? I want to use a pattern that is already on my machine but how do I make it larger? I want it to be 3 inches and it only goes to one inch. I so my question is can we make a pattern larger?? Hi Jessie, No, there is a limit to how big you can make the built in patterns. Enlarging a pattern 300% and having it stitch nicely is more complicated than the SE400 can do. Basically, you can’t just make the threads larger, you have to add new stitches, in the right color, and the right place. 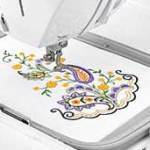 You need to find a similar pattern that is the right size and transfer it into the SE400.